This isn't a review, per se, so much as my recalling of a play session. 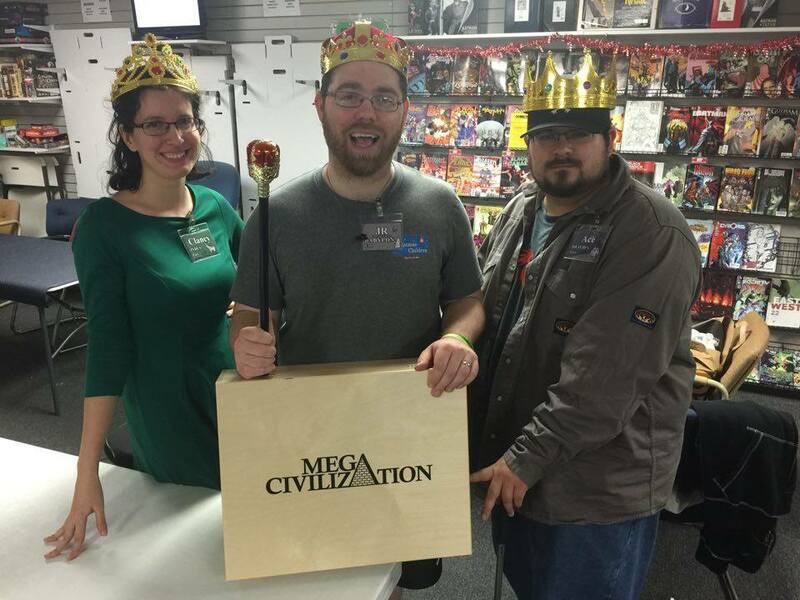 Mega Civilization is a re-imagining of Advanced Civilization, developed for the last 15 years and released in a $200 box. Learn more about Mega Civilization on BoardGameGeek.com. 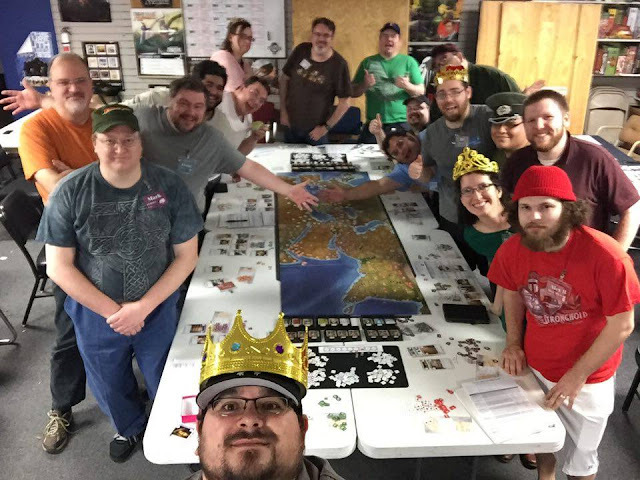 After purchasing Mega Civ at BGG.Con in November, I arranged an 18-player game for December 20th, 2015. We had 18 players join, and 17 players finish the game (one player had to leave early). We stopped two turns short of the end of the game because of time constraints, but I feel like we had a near-complete experience. I won with 92 points, Ace got 2nd place with 88 points playing Dravidia, and Clancy got third playing Indus. The game took about 11 hours, and would have taken about 13 had we not finished early. I ran the game, and had help from my friends Mark and John, who were captains for their sides of the board (East/West). I played this game as Babylon, stuck RIGHT in the middle of Mesopotamia, and in between some of the most famous forces of the ancient world - Egypt, Assyria, and Persia. This was my first full playthrough of Mega Civ, so I was operating on some general assumptions about how important various aspects of the game were - territory acquisition, trading, diplomacy, acquiring advances, and paying attention to the AST track. I assumed that territory acquisition was secondary to making good, strong trades, and that the most important thing I could do would be to get as much trade value as possible and get great advancements. The first 5 turns of any Mega Civ game are fairly uninteresting, but I did a few things early that helped me. Before the game began, Assyria and I (Alex D) agreed on a border that matched the middle split in the game board. Neither of us ever violated this, nor did we ever act aggressively towards the other on the map or in trading. It was a huge help to basically ignore a full third of my borders. The winner of the game won the beautiful crown. I made a similar deal with Persia (Mark) to maintain my eastern border, so I really only had to worry about Parthia (Luc) to the north, and Egypt (Isaac) & Saba (Peter) to the south. Since Mega Civ isn't a war game, that basically meant I could trade aggressively and expand slowly in both directions when I needed extra space, and as long as I didn't annoy Persia or Assyria my day wouldn't be wrecked. It turned out that I was pretty spot on, and territory acquisition wasn't a huge part of my game (though it may have been for some of my neighbors). I built to 6 cities as quickly as I could, then picked up agriculture and got to 7/8 cities. I focused on defending my northern border from Parthia (and picking up some of his territories when I needed to expand) and generally just keeping my tax support and city support numbers in balance so I didn't lose any cities to either. 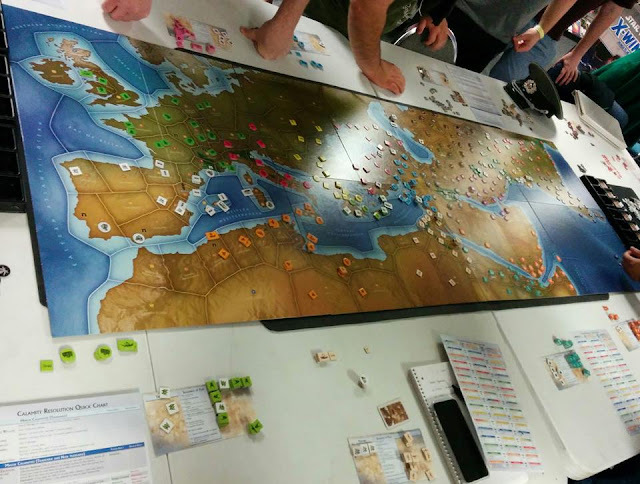 The second-to-last turn of the game, after I had pulled away as the clear leader (and had been called out for it by the rest of the group) I was dealt Civil War and Tyranny, two non-tradable Major Calamities. Civil War would have been the worst of these, as I had 8 cities and 24 units on the board (64 points, 29 of which would get lost to Civil War), so I went into the trading round aggressively looking for players who looked like they were trying to trade away calamities. You're limited to two major calamities during resolution, so I was hoping to pick up other calamities that would be less bad for me, and have Civil War randomly discarded from my hand. It didn't happen, and things actually got worse, as I picked up Epidemic to go with it. As a result, I was reduced to 1 city and 10 units, which meant I didn't advance on the AST track that turn (which required 3 cities and 3 advancements worth 100 or more), and lost 5 points to the other players who were chasing me on score who did advance (Ace as Dravidia, Clancy as Indus, Alex as Assyria, and a few others). That was a BRUTAL turn, but I walked away from it feeling challenged and excited about future turns, and I'm really proud of myself for maintaining a positive attitude. The far more interesting part of the game for me was the trading. Each round we were dealt cards equal to the number of cities we owned, so having more cities is better for amassing wealth (though you're also more likely to receive a calamity card). We set the trade timer at the recommended 10 minutes, and each round was like playing an 18-player game of Pit. I focused on completing sets first, and trading for value when I didn't feel like set-making was possible. I pulled off LOTS of 3-for-4 trades, even when the extra card was a level 1 card or even a water or calamity. I had a feeling it was better to have more trade cards, because there's more flexibility in making a deal, even though I had to lie a few times to push deals through (part of the game). Having more cards meant that I could make more trades, and since I was trading up in value on average, I amassed a ton of value early on that I turned into Agriculture, Metalworking, and Engineering. I later developed Roadbuilding and Mining - lots of orange cards, which gave me big stacking bonuses in orange and directed my strategy for most of the game. Metalworking and Engineering made my units and cities much tougher to eliminate, which let me worry less about playing defensive on my contested borders. Roadbuilding let my units move two territories, which made me much more flexible in staging invasions on the board - and I assume made my neighbors a little more wary about messing with me. I'd like to try other strategies as well, but this one was exactly what I needed as Babylon. Tough, fast, and flexible makes for a good army. There were three groupings of scores at the end, as you can see in the results: 1st-4th (92-82 pts), 5th-11th (76-66 pts), and 12th-17th (62-53 pts). I attribute most of this difference to missing chances to move up the AST track due to a lack of advancements, which is related to trading success and number of cities (as cities provide trade cards). What I find most interesting is that the gap between first and fifth place was 16 points, and the gap between 5th and 16th was 19 points. The difference in those groupings was geographical - Ace and Clancy had pre-established borders they didn't violate, which let both of them focus their efforts in other areas, and Alex D and I had the same beneficial arrangement. The Eastern side of the board scored a higher average (73.78 points) than the West (66.50), and I think a lot of that had to do with the Mediterranean. The players who started on or one space away from the Mediterranean had an average score of 68 (Minoa, Assyria, Rome, Iberia, Hellas, Egypt - not counting Carthage). It's a tight, heavily-contested area with lots of city spaces and lots of borders, much harder to defend than the edges of the map, particularly the Eastern edge, where Dravida had only two neighbors until players could sail through deep waters. Minoa is generally considered to be one of the harder starts (as I understand it), and I was really proud to see my brother JJ (Minoa) pilot them with success in his first game. He came in as a late replacement, and read the rulebook the night before the game, so it was great to see him mixing it up with folks who'd played before, or at least had more time to prepare. Clancy, Ace, and I were the winners, and got the crowns! Aside from playing the game normally, I also was the "Game Captain" and called out all game phases and generally kept the game moving. We played for a total game time of about 11 hours, so that's nearly 200 hours of "player time" going into the experience. That's a lot to manage, but I felt confident in rules knowledge, and took an "onboarding" approach to teaching, like you'd see in video games. Rather than sit down and teach the rules from go, I taught rules for only the phases that mattered as each turn progressed. This was super successful. Early in the game, moving, expanding, and building a city is all you're focused on, so it's enough to know "cities have to be supported" and "cities get you trade cards". Once trade cards are out, I started teaching trading mechanics and rules, and once players had enough cards to start trading towards advancements, I explained them in more detail than "they're worth points and give you abilities". 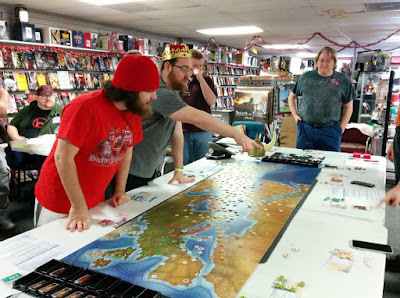 I had Mark (Persia) and John (Hellas) as captains on the East and West sides of the board, and their job was to answer questions and handle trade cards - dealing them, then preparing the decks after each round. Splitting up this task and delegating it to other people was a huge win. That kept me free to oversee game state 100% of the time, and to direct phases. Every player had plenty of down time, but the game was ongoing for the full time (except for a 45-minute lunch break) because tasks were handled well. From a setup standpoint, I took a suggestion from BGG and split the advancements into two separate tables, so each half of the board had something to look at during downtime. This was a big win, as I didn't hear any complaints about lack of accessibility to those cards. We started with 18 chairs around the game table, and ended with none - players would retreat from the board when they weren't acting and sit off to the side and chat. It was pleasant - like tailgating, in a way, with plenty of food and drink and lots to do when you're not actively engaged in something. If I had to do anything differently, I'd set the game on a Saturday instead of a Sunday, and make sure all the players were good until at least 2 AM. Our game lasted until about 10:15 PM (after a 10:30 start time), and a few players had to leave early to make it to work the next morning, so we stopped the game two turns early. Those last two turns could have made me lose the game, and I'm disappointed that Ace, Clancy, and Alex didn't get a chance to see if they could close the gap on me in those two turns. It would have been a thrilling finish. Also, I think I could have done a much better job of establishing some social conventions during play. 18 people in one room for 12 hours is a LOT of personal interaction, and the kinds of things we say and do in casual interaction often don't play as well over a long time in close contact. Mark suggested a "no sarcasm at the table" rule that I implemented about halfway through the game - not that joking and such isn't fun, but it's already difficult to resolve complex game-states as quickly as possible while also being accurate and fair. Adding in non-game-related banter on top of that (both informationally and aurally) makes this harder. Additionally, I needed to make a stronger statement about "the magic circle" and not taking in-game things personally. While Mega Civ isn't Diplomacy, there are still plenty of chances to go back on an agreement, or take territory from your neighbors, or lie during trading - things that are legal and critical in the game, but can lead to hurt feelings. I'm very proud of my group for maintaining a positive attitude throughout the game, and for those folks who weren't winning who still challenged themselves to learn and try to improve their positions as much as possible each turn. That kind of approach makes for a great experience, and makes me want to bring Mega Civilization to the table again as quickly as possible!